Govardhan Puja 2016: The main aspect of the Govardhan puja is installing the Govardhan hill. Devotees make Goverdhan hill either with cow dung or mud. People also use some crafty fixtures and art work to simulate the eyes, lips and face of Lord Krishna on the Govardhan image. Devotees als fix a peacock feather on it to highlight it. Govardhan puja also known as Annakut Puja is done on the next day of Badi Dewali and it is celebrated as the day when Lord Krishna defeated God Indra. 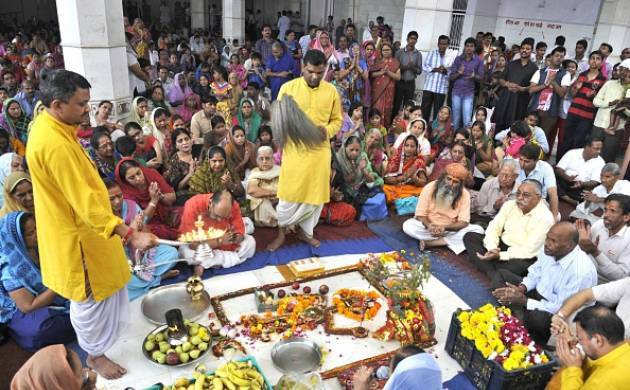 In several households, they too perform Annakoot puja which includes making Chappan Bhog featuring 56 varieties of delicious dishes that are all offered to God. The main aspect of the Govardhan puja is installing the Govardhan hill. Devotees make Goverdhan hill either with cow dung or mud. People also use some crafty fixtures and art work to simulate the eyes, lips and face of Lord Krishna on the Govardhan image. Devotees als fix a peacock feather on it to highlight it. According to religious texts, Govardhan Puja celebrations are suggested during Pratipada Tithi of Kartik month. Depending on starting time of Pratipada, Govardhan Puja day might fall one day before on Amavasya day on Hindu calendar.